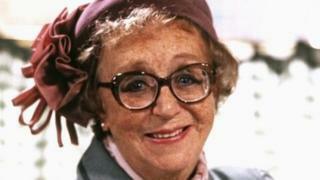 The Bafta-winning actress, best known for playing Edie Pegden in Last of the Summer Wine, died in 2003 aged 91. Morecambe and Lunsdale MP David Morris unveiled the tribute outside the Eric Bartholomew pub in Euston Road, near to where she was born. The MP had called for a blue plaque for her but English Heritage said in 2011 it was "too soon". The initial proposal for the commemorative plaque at the London nursing home where Dame Thora died was rejected as it was "too soon to make an accurate assessment of her lasting contribution to her field". English Heritage said it only considered putting blue plaques on buildings where eminent individuals have lived once they have been dead for 20 years or once the centenary of their birth has passed. Five years earlier, in 2006 a blue plaque had been unveiled at the same nursing home by another organisation, the Heritage Foundation, which specifically honours figures from the world of entertainment. The actress made her stage debut in 1911 at the age of two months when she was carried on stage at the Royalty Theatre Morecambe in a play directed by her father, who was also the stage manager. She was made a dame in 1993. As well as Last of the Summer Wine, Dame Thora also starred in Meet the Wife and In Loving Memory and presented Praise Be.